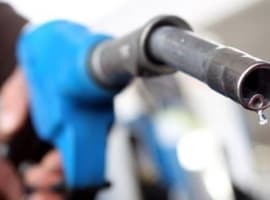 Oil prices fell on Tuesday morning as oil traders continue to voice concern about the plans of OPEC to increase oil production. - Fossil fuel consumption for electricity generation in the U.S. declined to 22.5 quadrillion BTUs in 2017, the lowest level since 1994. 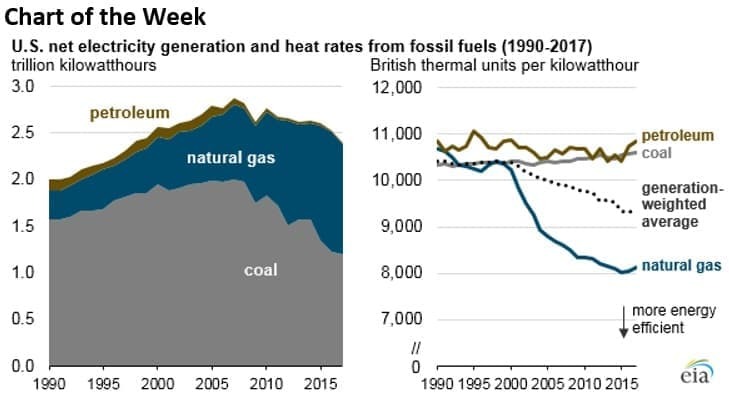 - The decline of coal and the near elimination of oil from the electricity sector is somewhat offset by the rise of natural gas, but efficiency and renewables have led to an overall decline in fossil fuel use. - Last year, coal consumption fell to its lowest level since 1982. - Natural gas, even though it too is a fossil fuel, burns more efficiently than coal. That means the generation-weighted average efficiency of the electricity mix has significantly improved. According to the EIA, fossil fuel plants in the U.S. required 10,400 BTUs of primary energy to produce a kilowatt-hour in 1994, but by 2017, that figure had fallen to just 9,400 BTUs. • Petrobras (NYSE: PBR) saw its stock price fall by more than 40 percent over the past month as oil workers walked off the job and the company’s CEO resigned. However, the appointment of the CFO to become the CEO allowed the share price to rally by 5.6 percent on Monday as fears of political meddling receded. • ConocoPhillips (NYSE: COP) is looking to sell C$2.7 billion of oil sands assets to Cenovus Energy (NYSE: CVE). Cenovus’ share price fell more than 7 percent on the news. • Golar LNG (NASDAQ: GLNG) and Golar LNG Partners (NASDAQ: GMLP) rose sharply on Monday on the start of commercial operations at the Hilli Episeyo floating LNG project in Cameroon. Pessimism is back in the oil market, at least for now, on rising expectations that OPEC and Russia will hike production. WTI dipped below its 100-day moving average this week, breaking technical resistance to lower prices. “We are breaking key levels of support now,” Phillip Streible, analyst at RJO Futures, told Reuters. “Once we started taking out $65.50 or so, it really started to accelerate. People are not really believing that the rally will continue,” he said. U.S. asks for 1 mb/d from OPEC. According to Bloomberg, the U.S. government has asked Saudi Arabia to boost oil production by 1 million barrels per day. The request would be unusual, but not surprising since high gasoline prices are always a political threat to the party in power. It does not seem that Saudi Arabia and Russia have reached an agreement yet, but the two countries are considering several options for an increase in production. Chinese oil inventories weigh on OPEC. OPEC has aimed to drain OECD inventories below the five-year average, an objective that looks to have been completed recently. However, now they have their sights on China’s oil inventories, which have been on the rise. The problem is that precise data on Chinese inventories is hard to come by, but Ursa Space Systems, an oil data company, estimates that inventories have climbed by 130 million barrels over the past year in China. OPEC is concerned about boosting oil production while China is sitting on a mountain of supply. 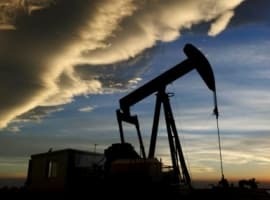 Canadian oil prices surge. Western Canadian Select (WCS), an oil marker that tracks heavy crude in Canada, has traded at a massive discount to WTI this year, with prices at times falling as much as $30 per barrel below WTI. However, WCS surged this week after Enbridge (NYSE: ENB) said it wouldn’t implement a new procedure to prevent shippers from claiming more space than they can use on a vital pipeline that runs to the U.S. WCS jumped more than $12 per barrel after the announcement, putting the discount to WTI at just $13 per barrel. Oil tankers scrapped at high rate this year. The shipping industry will scrap the largest number of oil tankers this year in over a half-decade, according to Reuters. The pace of scrapping comes after years of overcapacity and low rates, with the OPEC cuts also hurting demand for shipping. “The tanker markets are definitely in a trough at the moment, with one of the worst years in a decade in terms of freight rates and returns,” Ralph Leszczynski, head of research at ship broker Banchero Costa, told Reuters. The poor market conditions will last until next year, but the removal of excess capacity will help. 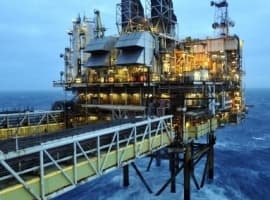 Banks raise oil price forecast. A Wall Street Journal survey of 12 investment banks shows analysts see much higher oil prices this year than previously. In May, the banks revised up their expectations for oil prices in 2018, with the 12 banks averaging $70 per barrel for Brent in 2018 and $66 for WTI. 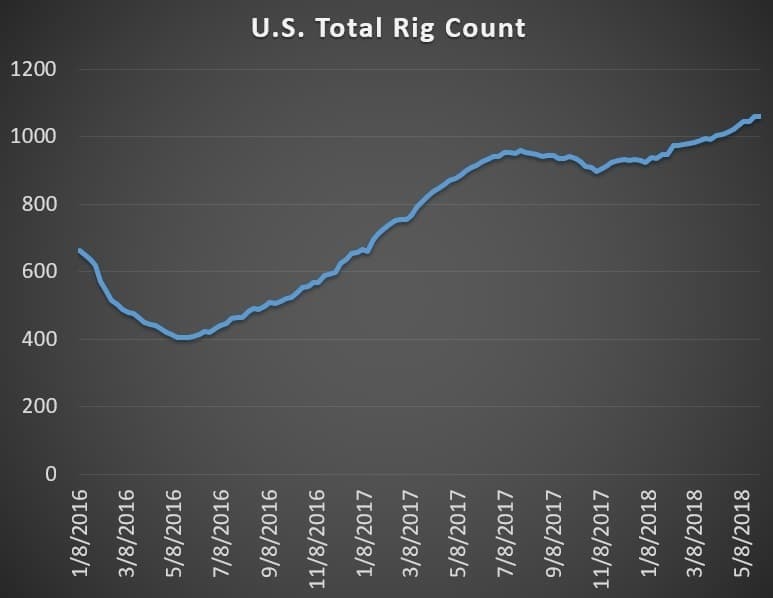 That average is up $6 per barrel from April. However, the banks likely did not incorporate the recent meltdown in prices or the prospect of higher output from OPEC. Motiva scraps major refinery plans for Gulf Coast on Hurricane fears. The Saudi-backed Motiva Enterprises, which runs the largest refinery in the U.S., decided against a major expansion at its Port Arthur, TX facility over fears of hurricane risk. Motiva was considering an enormous 900,000-bpd expansion. Motiva remains committed to “investigating opportunities to return to a refining scale of 1 million to 1.5 million barrels per day, (but) we do not expect to achieve this increased refining scale through the Port Arthur Refinery,” company spokeswoman Angela Goodwin told Reuters. Sources familiar with the matter said Motiva was concerned about concentrating all of its assets in one location, after last year’s Hurricane Harvey disrupted operations. Qatar Petroleum to buy stakes in Argentina shale. Qatar Petroleum signed an agreement with ExxonMobil (NYSE: XOM) to buy a 30 percent stake in two subsidiaries of Exxon in Argentina. The deal opens the door for Qatar in the South American nation. Good time for SNAP BACK SANCTIONS, some people just don't learn.